A pleasant environment and a happy frame of mind contribute towards a patient’s speedy recovery. Everyone associated with FV Hospital shares this belief and, as such, will do everything possible to make your stay pleasant and comfortable. It goes without saying that medical and nursing care must be excellent, but modern hospitals must also provide excellent non-medical care. The customer services needed, provided and expected in a modern hospital are not unlike those of a five star hotel. The Customer Service Manager supervises all administrative information flows (phone operators, information booths, literature, front desk, translation services and admission procedures), signage and interior decoration, organisation of the waiting and public areas, VIP lounge, guest relations, transportation and all inpatient and outpatient hotel services detailed below. One of our International Patient Coordinators will respond to all questions and concerns that you may have already before you leave for Vietnam: from your first contact with FV Hospital to planning and coordination of your treatment. Our professional and customer service oriented International Patient team will take all possible steps to make sure you get the right information and support. We offer a full range of exclusive top quality customer services dedicated especially to our international patients. During your stay, our International Patient Officer will support you and assist with any concerns or requirements which you may have. Patients are also encouraged to participate in their health care procedure by asking questions of the attending physician and nursing staff. The physician will explain, in clear terms, all aspects of your care and condition as well as all proposed tests, procedures and medication (and the cost consequences as applicable), whenever possible, before any procedure is undertaken. Our International Patient [Officer]/[Coordinator] will always be available to you if you have any suggestions or complaints. We take any and all suggestions and complaints very seriously indeed and endeavour to act upon them in a prompt and positive manner. A patient’s privacy, personal dignity and liberty are absolutely valued before, throughout and after their stay or consultation. All personal information is treated as confidential and will only be shared on a need to know basis with relevant hospital personnel. As an international hospital that treats many non-Vietnamese nationals, we understand communication can, on occasion, be difficult. FV Hospital will assist you in your communications. Most of our nurses speak English or French and Vietnamese, and we have on staff many translators/interpreters for other languages. If you have any difficulty in communicating your needs or if you require an interpreter to speak with our medical staff in more detail, please inform our International Patient Officer who will make the necessary arrangements. No additional charge will be made for our translation/interpretation services except if you require us to call in an external translation/interpreter. Patients can rest assured that language should present no barrier as appropriate staff who can communicate in the patient’s own language will be assigned according to the patient’s needs. FV Hospital provides a complimentary air-conditioned shuttle bus service to transport patients and their visitors to and from the FV Hospital. The regular direct service runs every day except Sunday between the Saigon FV Clinic in District 1 (45 Vo Thi Sau St) and the main entrance of the FV Hospital. The shuttle bus tours are free of charge and runs according to a fixed schedule. View schedule here. For more information about our transport services click here. In the lobby: The lobby waiting areas have a pleasant and calming ambience, understated lighting and tasteful decoration, with comfortable seating for patients and their visitors. Many communal services are easily accessed from the outpatient areas. In or adjacent to the lobby area you’ll find: the coffee shop/cafeteria, an internet café, Wi-Fi connection, plush sofas, daily newspapers, TV entertainment, the gift shop and an ATM machine. Hospitalised patients and their visitors can use these facilities and, with their doctor’s knowledge, lunch in the cafeteria (not included in the package price). For more information about our lobby experience click here. FV Hospital is committed to achieving total patient satisfaction through superior quality health care services, together with the comfort and convenience of five star hotel services. Some of the comforts and services are obvious, others less so, but all are worth mentioning. 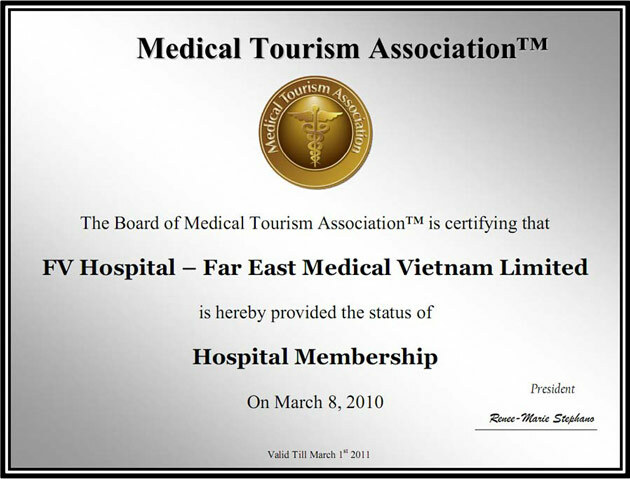 FV Hospital is fully equipped for all your medical treatment and monitoring needs. All our wards are clean and spacious. The international patient wards and the associated rooms have a contemporary design with Japanese, Chinese and Indian themes. The room facilities include cable television, international direct dial telephones, high-speed internet access, individually controlled air-conditioning, nurse call systems, safety boxes and en-suite bathrooms. Each room is also equipped with state-of-the-art computer technologies which make the patient’s complete medical file directly available electronically, helping the doctor to treat the patient more effectively and efficiently. The computer technology also minimises any chance of incorrectly medicating the patient as medical staff have to scan the medicine into the computer in order to cross-check it was prescribed by the doctor. For your added convenience, we offer private rooms, VIP rooms and suites which are all comfortable, airy and well-lit. The room charges are inclusive of around the clock nursing care, specified disposables – such as IVs, catheters, syringes and bandages, service charges for in-room amenities, and, three hot meals with a choice of tasty Vietnamese or Western cuisine, served each day by our in-house catering staff. For more information about your stay at FVH click here. From the moment you are welcomed by FV Hospital, your progress, needs and requests will be noted and actioned by our International Patient Officer. During your stay, the International Patient Officer will visit you daily to check on your status as well as your level of comfort and any concerns: for any medical concerns, the attending physician and nursing staff will determine the best course of action. Your comments are also welcome. Please direct your suggestions, or any complaints which you might have, to the International Patient Officer. Our aim is to provide the best quality medical and non-medical services possible, thus assisting us to achieve our ultimate goal - total patient satisfaction. This is an ongoing commitment from all at FVH.